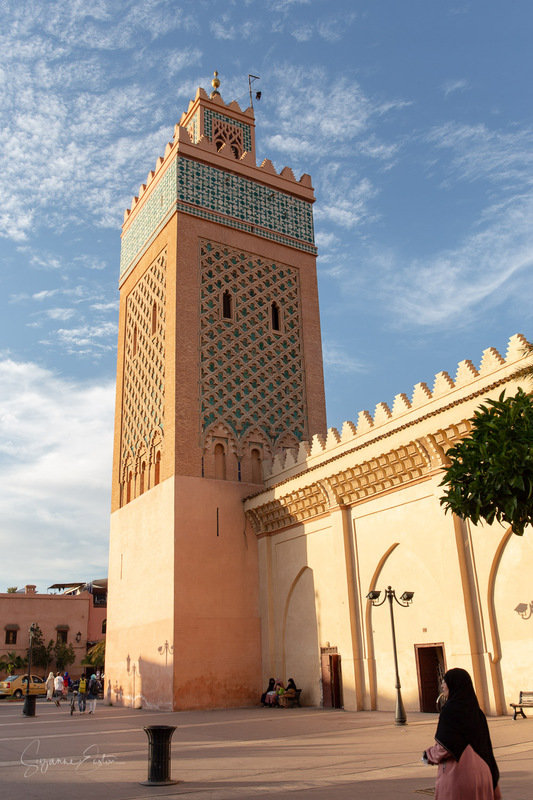 Dominant over the Kasbah in Marrakech is the minaret of the Kasbah Mosque. Intricate patterns in green dance over the upper side of the minaret and glimpses of the gardens beyond the high walls are all that is seen as a non-muslim. Tucked in the far corner of the open plaza that surrounds the mosque are hawkers with their smiles and generic tat. 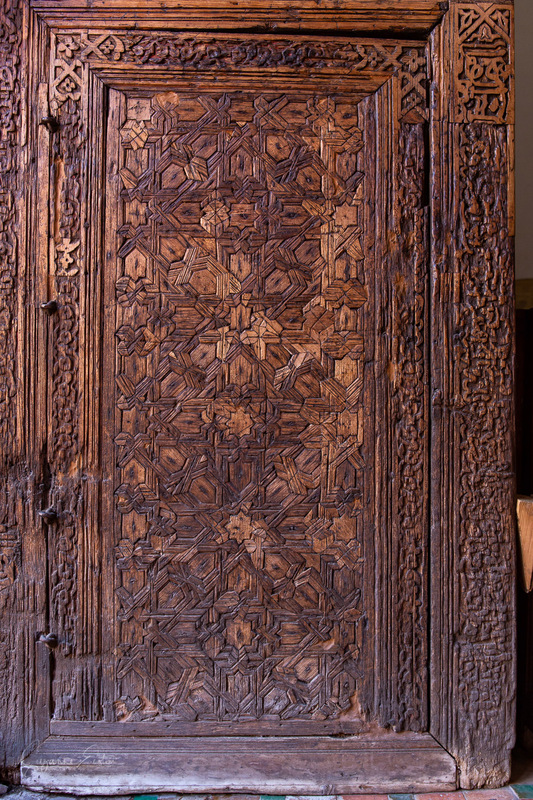 This is always a sure sign that there is something that may be worth visiting in Marrakech. Paying the entrance fee all we see is a long walkway, patterned from the trellis above shading us from the heat of the early afternoon sun. This passage zigzags, becoming narrow and dark as the overhead light is filtered from view. 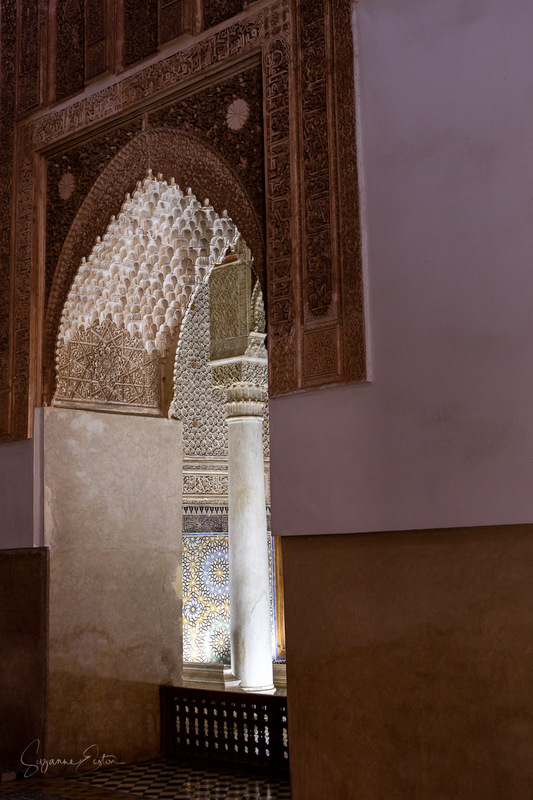 This small passage was the only way into the Saadian Tombs from the 1600's when Alawite Sultan Moulay Ismail walled them up to keep the past out of the minds of the present residents of the city. They were hidden and forgotten by everyone in the city except the storks living on the walls until they were rediscovered in 1917. Turning the final corner the small gardens come into view. Cool and inviting after the heated bustle of the city beyond the walls. 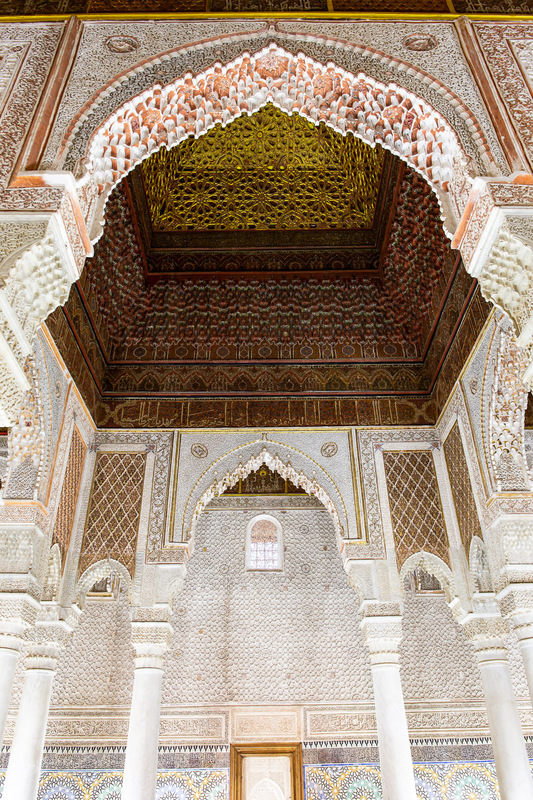 This ornate and tranquil space was not what was expected at all. 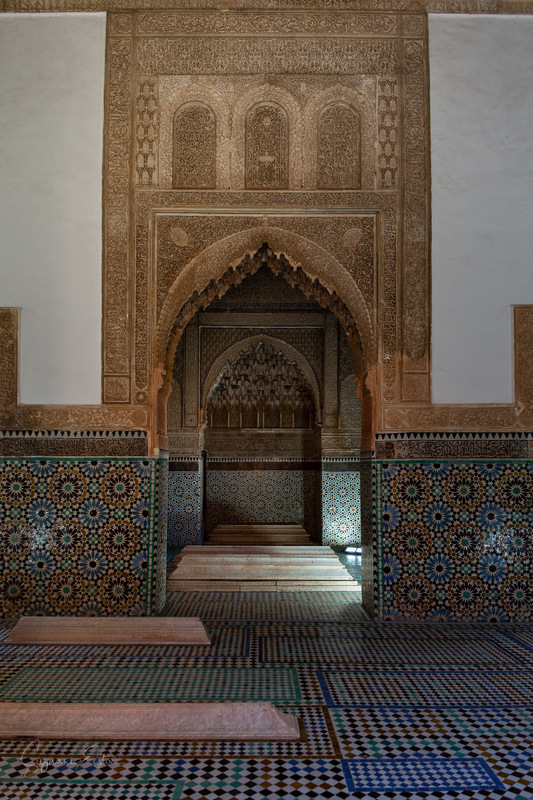 The Saadian Tombs are the resting place for 60 members of the Saadi Dynasty which was lead by Sultan Ahmad al-Mansur (1578-1603) and who reigned over Marrakech between 1524 and 1659. The sultan spared no expense on his tomb, which he updated from the more basic 14th century necropolis. The improvements started with the internment of his father Prince Mohamed Sheikh in 1557. 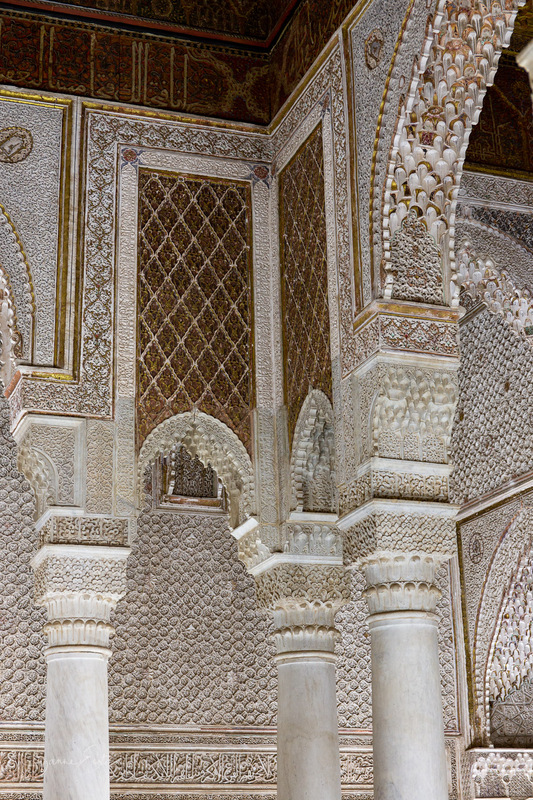 He imported Italian Carrara marble and gilding honeycomb muqarnas (decorative plasterwork) with pure gold to ensure the Chamber of the 12 Pillars mausoleum was suitably grand. He ensured the princes of the dynasty were nearby in the Chamber of Three Niches and in the gardens were his chancellors, servants and wives. All were watched over by the grand mausoleum of his mother. Carved with blessings and poems and even today guarded by the stray cats. 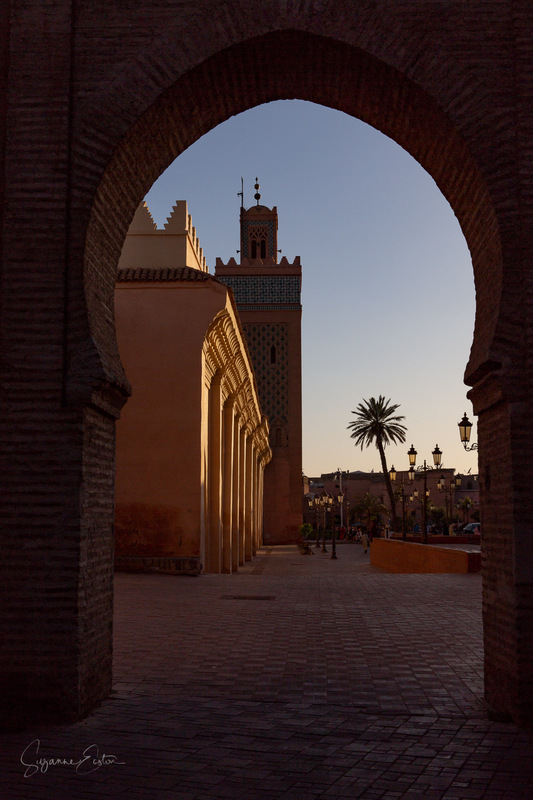 This serene area is suitably grand and still a little hidden secret amidst the bustle of Marrakech Kasbah.